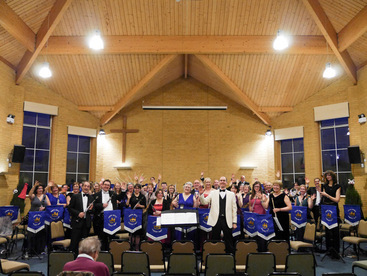 South Berks Concert Band (SBCB) is delighted that it held the first of its 2017 concerts in the modern spacious Kennet Valley Free Church in Fords Farm. We were very fortunate to be given the opportunity to utilise this wonderful venue once again and see many of our old friends who have supported us over the years, as well as meeting those of you for whom this was the first SBCB concert you have attended. Do look out for more details of other concerts and events on our news pages and in the Holybrook Newsletter delivered to the local community. We are pleased to have the support of Holybrook Parish Council to help us reach more people in the local area, and hope that our presence will encourage more people to come together to enjoy live music in this community, YOUR COMMUNITY!